If you're dropping by from Kristy's blog hop, welcome! If not, well, welcome anyway :) In case you don't know what a blog hop is, a blogger (such as the awesome Kristy) hosts a virtual gathering of bloggers and develops a schedule where we all hop on over to each other's blogs during a set amount of time. Each blogger has a "spotlight day" where all the other bloggers visit to "meet" the spotlighted blogger. Does this make sense? Anyway, today happens to be my "spotlight day" in the blog hop. I thought I'd give a little more of my background, other than what you can find on my About page. As a running coach, I am often asked how long I've been running and how I got started. I usually give the "my older brother was a runner" story of how I got started and that I've been running since middle school. There really isn't anything magical or extraordinary in the how I got started as a runner. It's the why I keep running that I don't often talk about. Up until 2009, I was like every other runner. I ran because it was fun, social, competitive, all of the above. I challenged myself with new distances and goals and I kept going because it felt good. It's what I have always known. It's what I always did. It was "my thing," if you will. But in 2009, why I ran changed. In the spring of 2009, we found out we were pregnant with our second child. We were excited and nervous about adding another family member. And even though I had some troubles with my first pregnancy, we were full speed ahead with Baby #2. But in July, 2009, those plans came to a screeching halt when we lost our baby at 17 weeks. I won't go into the details because they are still quite painful all these years later but this was by far the most tragic thing to ever happen to me and us, as a couple. Delivering a baby that we never got to hold was the very worst thing to ever go through and I still think about the little boy we lost. In those weeks and months following our loss, I went into a deep depression and never thought I'd do anything, let alone run, again. Granted, I still had to go through the day-to-day of our lives. I still had to go to work, take care of our son and go about life as best as I could. About 2 months after our loss, the fall season of Girls on the Run began and I shifted my focus to these girls and our team. I can honestly say, this is what helped saved me. When coaching, you leave your crap at the door. You need to turn off whatever you're going through, especially when coaching kids. Having that hour twice a week where I didn't have to think about anything but just laugh and play games and run made me feel like a person again. I started running again shortly after the season started but it was horrible. I was so mad at my body for failing me that running caused me too much emotional pain. I'd often have to stop after about half a mile to catch my breath and try to stop crying. I felt so out of control with everything, but especially my body. I threw myself into coaching. In addition to Girls on the Run, I was also coaching adults privately and in a few groups. I really can't tell you how much helping others helped me too. I saw these people, of all ages, challenge themselves and take control of their lives with this one simple act of running. So I kept at it with my own running. I would soon be able to make it a full mile before crying. Then 2 and so on. I clearly remember Thanksgiving 2009 and running 5 amazing miles that morning. And so I hesitantly set a goal: to run a 50K. Why a 50K? Well, I had done a number of marathons at this point and felt that I needed more. I needed to prove to myself that my body was capable of doing some grand. That if I could get my body to finish this race, maybe I could love it again. Maybe I wouldn't be so angry. I chose the Greenway 50K in March 2010 because it is put on by the local Road Runners group and I could train on the course. It is also low-key, less stressful and more fun than road running. So now that I had something to focus on, I moved forward. I trained hard, through a brutal winter with 3 different blizzards. I was lucky to have a great group of friends to train with and lean on when my miles were filled with more tears than laughs. And on March 6, 2010, I crossed the finish line of my first ultramarathon. It was such a bittersweet moment. So happy but still so sad. But when I crossed that finish line, I made a promise to myself to keep moving forward. To respect and honor the past and all the heartache I went through, but move forward to live the life ahead of me. first 50K based upon my snazzy outfit? Sheesh! And so I keep moving forward. Shortly after that race, we found out we were pregnant with twins (we found out the day before the anniversary of our loss). We also found out we were moving across the country from the Washington, DC area to San Diego. As soon as our girls were born and we were settled here in CA, I started my coaching business and started running again. I continue to move forward because it's what keeps me sane. I challenge myself with crazy races and ultras because I need to see and feel that my body is not the mess I once thought it was. My body can handle anything I put it through. I still can't believe I finished a 100K just a few weeks ago. I will keep pushing until I can't anymore. I may have setbacks and hiccups like the issues I'm dealing with now, but they won't stop me from trying anymore. And that is what helps me help my clients know their bodies can do the same thing. We are capable of so much more than we think. We just have to try. And keep moving forward. 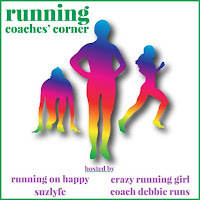 In addition to the blog hop, I'm also linking up with Susie from the Suzlyfe, Lora Marie from Crazy Running Girl, Debbie from Coach Debbie Runs and Rachel from Running on Happy for the Coaches' Corner blog link up. Check these awesome ladies when you're done here! I'm sorry to hear of your loss. I'm not a mother but I know that must be a truly painful thing to go through. I really admire people who pull through a difficult time and finding something that helps you do that is essential. I do understand how accomplishing things as a runner can help you regain faith in yourself- running helped me feel like my life had meaning again when I was truly unhappy with my circumstances. Thanks so much for your kind words. I'm thankful that running is always there as a way to deal with life! That is a powerful story! Thank you for sharing! GOTR is one of the best programs I've ever been a part of! Great to see you in the hop as well! It was great to get to know you better and to find out how you started running. I'm so sorry for your loss. I'm on my labor + delivery rotation right now and I know that can't possibly have been easy. <3 :[ Thank you for sharing your story, and major props to you for doing a 50k!! Thanks so much for your kind words and for reading, Farrah! Running got me through pregnancy loss and infertility. I felt like my body betrayed me but running made me feel strong again. What a powerful sport, right? Exactly, Wendy! Amazing how something as simple as putting one foot in front of the other can be so life-changing! I'm so sorry about your loss. It was wonderful that running and coaching were there to help you through your pain. Thanks for sharing your story and for linking up. What that is quite a story and so powerful. I am a GOTR coach as well and the program has given so much back to me. I love how you poured your heart into it and how that helped you heal and give you a purpose. Great to connect with you! Thanks so much for your kind words, Debbie! Jenn, I hope you can feel my virtual hug! Hope I get to hug you soon IRL! Love you so much B! Wow, thank you for sharing your story. I am so sorry for the loss that you and your family endured. It's amazing how running can help us with so many personal challenges in life. I've never participated in GoTR but they seem to be a fantastic group. Congrats on your coaching and ultrarunning success, so inspiring! Thanks so much for your kind words, Janelle. I appreciate that! And if you ever have the chance to check out GOTR, you should. It's amazing to be a part of such a great program. They were absolutely teaching me. I am forever grateful I had them in my life! Thank you so much for your kind words, Tricia! I have always said that running has gotten me through my lowest lows and highest highs. During those time when I felt like I had nothing, I always had running. Thank you for sharing your story! That is exactly true: even when it feels like you have nothing, you still have running to help deal. Thank you! I run to save my sanity for sure. I started running more seriously when I was the primary care taker of my mom after her triple bypass. Running got me out of my house and gave me a reminder of my fortune to be able to run. I enjoy the me time and the connection with nature for sure as well. I hope when my daughter is of grade that she will want to do Girls on the Run but we will see. Good to see you again too, Tamieka! Thank you for your kind words. Running definitely saves lives in so many ways!! I hope my girls do GOTR too! What a powerful story of how running helped you through a difficult time. You are a courageous woman! May your life continue to be filled with many moments of overcoming the goals you set for yourself as you run, coach and raise your beautiful family! Though I have not experienced anything as heart wrenching as what you went through, I understand what it is like to need something that will teach you to believe in something again. To trust your body again. And to pay it forward to another. Mad props on the 50K! That is a distance that I never see myself doing. I'm glad that running and coaching was able to help you through the tragedy of losing your child. Thank you so much for being so open and honest. I'm so sorry you had to go through that and I'm glad to hear that running was there for you. It is so nice to meet you through this blog hop! I am so impressed that you did a 100 K! That is amazing! Thank you so much! I still don't believe I did the 100K myself! Wow, I love your story! Your right, sometimes the WHY we keep doing something is far more important than the original reason we started it. I've found myself running and the community within it can really be a great way to relieve pressures, stresses and let go even just for an hour or so a day the things that we can't get off our minds. I am so impressed with the ways you keep pushing yourself, 50k and then 100k, AWESOME! Thanks for joining the hop!!! Wow, what an incredible journey you've been on. I'm sure that your son is quite proud of his mama and is looking down on you everyday with pride. Thank you for that. It brings tears to my eyes. I hope you're right. What an amazing story ;-) You are SOOO correct when you say that is through helping others that we best help ourselves. Congrats on finding your "running self" again, and congrats on all your accomplishments! Thank you so much! I have always found such joy in helping others but I never thought I would need it to get through something like this. I am thankful everyday for all that running has brought into my life! It's amazing what those two times a week with the girls from GOTR can do! Even if you wanted to bring your baggage with they will make you forget everything for that short period. I am actually taking a break from planning our practice 5K on friday to visit todays bloggers of the blog hop. You have had an amazing journey, thanks for sharing! Woo hoo for GOTR!! It is such a great program and I am so lucky to have had it in my life. I can't wait until my girls are old enough to participate! Good luck with your 5K and the rest of your season! Wow! I never heard your story before. What happened was awful but you found a way to continue on and find your love for running again. And look what all you accomplished. So impressive! Thank you so much for your kind words, Amanda. I appreciate them so much! Wow- what a story! I can see why you keep on running! While I can't imagine the loss you experience, I can easily see how running helps you to keep the stresses down and as an outlet to pursue goals and get stronger... not just as a runner but as a person. Thanks for sharing your story and I'm glad to be able to "meet" you! Thanks so much, Lauren! It is definitely part of my coping process! Working out and focusing on your body can really help you heal. I'm sorry to hear about your loss and depression. But what a good job you did by getting back on track with running. I really need to work out 2 or 3 times a week to keep my depression at bay. Keep it up girl! I've read your blog before but the blog hop is such a unique opportunity to know the blogger better. Thanks for sharing your story. Even though you lost your son and will never forget about him, Look how much good has come to your life since. I was just talking with someone about not giving up when things are hard. There will always be hard things but if we keep moving forward, there will be good things too. You are absolutely right. We have to keep moving, good things will come our way too! Fool-proof pumpkin purée in 10 easy steps!